Jenny finally got in a good sail. For the past few years she has been waiting for a good Southworth sail. She has been out on the boat a few times, but the wind has never been too cooperative. 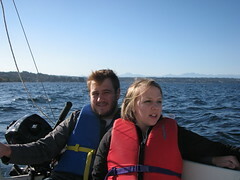 This weekend provided the conditions for a perfect sail. Bjorn got to skipper his dad's new boat for the first time as well. I repaired the rudder this week after an adventurous mishap last weekend, and the boat handled well. After saying a goodbye to Markus on Friday night, Esther and I had twelve hours of empty nest before Bjorn, Jenny and Ada came for a visit. Jenny and Ada had just flown in from Georgia for a visit with Jenny's sister Jill and new baby Jackson. it was good to hear about the two young mothers comparing notes. Esther and I got our 'Ada fix' this weekend. But now it's time for the real empty nest.